Executive Chef Matthew Adler of Ballo Italian Restaurant and Social Club, located at Mohegan Sun in Uncasville, Connecticut tempts the palate with his creative recipes for Ricotta Gnocchi, and Scallops and Scampi with Corn, Spinach, and Sopressata that will inspire a trip to the restaurant. I met Executive Chef Matthew Adler in late morning after an exceptional dinner at Ballo Italian Restaurant and Social Club the previous evening, July 13, 2012. Although it had been a late night for him, he looked thoroughly refreshed and ready to tackle another long day in the kitchen. Passionate about his chosen field, when I asked what career he would have chosen if not that of a chef, he said that he did not know. The Rockland County New York native literally grew up in the business, as his father is also a chef, and he worked doing every job in the restaurant, which helps him to appreciate the hard efforts of his team. Chef Matthew Adler furthered his culinary knowledge graduating from the prestigious Culinary Institute of America (CIA) located in Hyde Park, New York, followed by honing his skills working with The Ritz-Carlton in their restaurants in Boston, Washington, D.C., and New York, at also at the New York restaurants Oceana, and Convivio. He also worked for 18 months for the legendary Chef Alain Ducasse at the Essex House in New York, and credits him as a chef who inspires him, as he is very ingredient and technique driven, with clean, simple flavors, and lighter French culinary style reminiscent of the Riviera and Monte Carlo areas. For those considering a culinary career, Chef Adler wisely advises to spend time working in restaurant kitchens before you go to culinary school. Culinary schools are expensive and entry-level positions do not pay that much, so make sure that cooking is your passion. Find chefs that inspire you, spend a couple of years working in a restaurant, and then go to culinary school. Once you graduate, stay at a restaurant for some time and do not jump around from place to place, as you will spend the first year figuring out what the chef wants, learning how he wants it done, and then having a common goal. 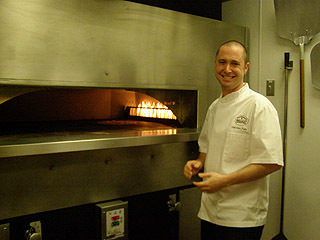 Chef Matthew Adler has been with the 16,000 square foot, 300+ seats, Ballo Italian Restaurant and Social Club since its opening on September 25, 2011, and is full of praise for his Chef de Cuisine Shaun Golan and his FOH (front of house) team, because a restaurant experience is about both the food and the service. His culinary style at Ballo Italian Restaurant and Social Club is very ingredient driven focusing on the best possible products, whether local, or imported from Italy. The menu changes seasonally, although there a few classic Italian staples that remain year round with only the garnishes changing according to the season. His focus is clean and rustic, with never more than three or four items on a plate. Every chef has a favorite ingredient, for Chef Adler, it is olive oil, because like wine, there are so many variations, and you can really taste where it originated. He has traveled extensively domestically and internationally in France as well as in Northern Italy exploring Tuscany, Bologna, and Rome, as a continuing culinary education to increase his knowledge and pleasure. Executive Chef Matthew Adler graciously shares his tasty recipes for Ricotta Gnocchi, and Scallops and Scampi - Corn, Spinach, and Sopressata, to tempt your palate and inspire you to make a trip to Ballo Italian Restaurant and Social Club. Method: In an electric mixer, add the cheese, eggs, salt, and pepper and mix on low speed until well incorporated. Slowly add in the flour until the ingredients have formed a ball of dough. Be careful not to over mix or you will have tough gnocchi. Wrap the dough in plastic and rest for one hour in the refrigerator. Slice the dough into 2-inch sheets with a large kitchen knife. The cut 2-inch logs out of each sheet. Roll the dough on a well-floured board until even round logs are formed. Cut the dough into 1-inch sections. 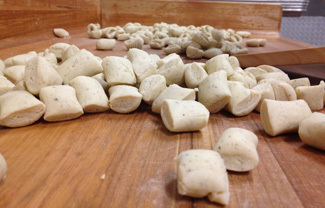 Roll the gnocchi over the back of a fork to form a nice indentation. Method to Cook Gnocchi: Place the gnocchi in boiling salted water. Wait 30 seconds after they float and remove to a waiting sauce. Method: Preheat oven to 400° F (204° C). In a large sauté pan, sear the scallops and prawns well, transfer to the oven for 2-3 minutes to finish cooking. Meanwhile, heat 2 tablespoons olive oil in another large pan. Add the sliced garlic and sopressata, cook until the garlic softens and begins to color, about 1 minute. Add the corn and cherry tomatoes, cook for 2 minutes longer. At the very end, add the spinach and parsley, toss together just until the spinach starts to wilt. Season with salt and pepper; add lemon juice to taste (about 1 tablespoon). Presentation: Divide the corn among 4 warmed dinner plates, top with three scallops and prawns each, drizzle with additional extra virgin olive oil and soppresatta oil, and serve. Method: Combine all ingredients and heat slowly, stirring until the oil begins to simmer. Allow to cook for 20 minutes. Let the oil cool to room temperature, then strain through a coffee filter. Sopressata Oil will keep in the refrigerator for 2 weeks or in the freezer indefinitely. Ballo Italian Restaurant and Social Club is a treat for the senses with its soaring columns, Gothic arches, wood paneled ceiling, hardwood floors, antiqued brick walls, antique wall scones and lighting fixtures, and interesting art that add visual appeal. 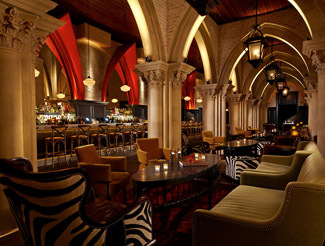 However, it is the 158 foot double-sided Carrara marble bar that draws the eyes when you enter with its red trimmed Gothic arches and expansive collection of spirits, and the zebra print chairs that accent the inviting lounge sitting area where you can relax with a pre or post dinner cocktail, or opt to have dinner there at one of the low tables. In fact, you can enjoy the full menu sitting at the bar, in the lounge area, private dining rooms, or in the main dining room, allowing guests to create their own experience of elegant fine dining or more relaxed, casual dining. 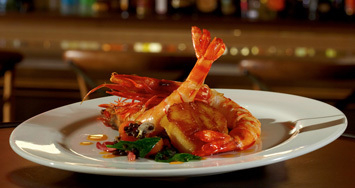 Read about Ballo Italian Restaurant and Social Club in the Restaurants section. 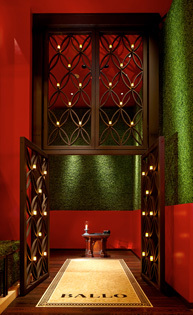 Follow Ballo Italian Restaurant and Social Club on Facebook at www.Facebook.com/BalloItalian, Mohegan Sunon on Facebook at www.Facebook.com/MoheganSun, and Luxury Experience on Facebook at www.Facebook.com/LuxuryExperience.